I love how a blanket of snow clarifies things visually. Shapes and contrasts become beautifully graphic and crisp. 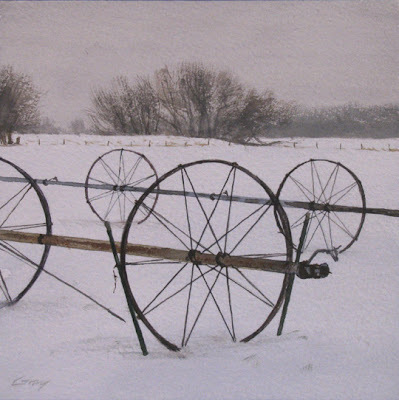 I've studied the irrigation wheel lines for years, but this is my first painting of them. If these lines weren't secured to the ground with steel posts, the winter winds would blow them across the field, twisting the pipe into a mess of spaghetti. I am overwhelmed by all of you who have written or called in response to the loss of my mother. I'm deeply moved and grateful for your expressions of kindness and support...thank you! Gorgeous, spare, elegant, not a misplaced nor an extraneous stroke, elegiac… Wow. I love this piece Don! This is beautiful - I can just feel the coldness and love the shapes. So, so sorry to hear about your mom... what a wonderful legacy she left in her suppport of your art! She had to be so proud of you. This is really a stunning image; it's as if you were drawing in/on the winter air and the lines just froze there - into this composition. The wheels themselves remind me of May Ray and Duchamp sculptures. They seem more about art to me than function! But then - that's an artist's brain for you. Man is that clean and spare. A perfect little painting, what a well observed gem! The lines are only used in spring/summer. In the winter they are staked down, because we get some fierce winds then. David--what a fine compliment you honor me with--thank you! Hi Laurel--thanks so much for your supportive words. What an interesting comment, Patrice--thank you. I like the reference to Man Ray/Duchamp, and the "found art" aesthetic. I've always thought there was more than a little art in these strange snakes on wheels! Hey Marc--good to hear from you and thanks a lot. Merry Christmas! So beautiful, Don! I keep coming back to look at it. This is extraordinary, Don. Yes, that's precisely the word. I also loved the words Patrice used. You fill us all. Thanks Sam, what a nice thing to say. Martha, thank you. Happy Holidays! I appreciate it, M. Happy Holidays to you as well! This looks soooooo visually interesting! I don't think I've seen wheels poking out of the snow like this before! Hi Dean--thanks for those generous words!